The ventricular septal rupture is a rare complication (1-2% of all patients with myocardial infarction), with a decreasing incidence (0.2%)1, due to increased early myocardial revascularization possibilities. In the absence of an adequate surgical treatment, mortality is extremely high, being about 25% on the first day, 50% in the first week and 80% in the first month2. This is due to the syndrome of cardiac insufficiency and to quickly installed multiple organs failure. low pressure and reduced risk of bleeding). The postoperative evolution was good, the patient left the ICU department on the 5th day. The follow up echocardiography, shows the presence of two insignificant residual shunts with combined Qp/Qs = 1.3, with no dilatation of the right ventricle (Figure 5). However, raithe patient shows bilateral pleural collections, significant (1000 ml), serum citrine, which requires multiple pleural punctures. The collections gradually decreased during the same hospital admission. The patient is discharged on the 21st day postoperatively, in good clinical condition, without pleural collections, the echocardiography showing the absence of residual shunts. The follow up echocardiography at 1, 6, 12, 18 months shows the absence of residual shunts and a significant improvement of cardiac kinetics. The patient is in excellent clinical condition (NYHA I). occurring in a large percentage (41%):7-9 major residual shunt, ventricular free wall rupture, device embolisation, as well as a high mortality of 35%10. Recent studies suggest the possibility of using mechanical circulatory assistance (Impella Recover LP) as a bridge towards the surgical closure of the rupture or to transplantation11. This mechanical assistance can be introduced percutaneously, and help decreasing the Qp/Qs and the pulmonary artery and capillary pressure, as well as increasing the cardiac index. Although it has been used for small series of patients, it seems like its benefi ts exceed those of the IABP12. Although the rupture of the ventricular septum had a diameter of only 18-20 mm, it was not possible to directly close it with a circular patch because of the fragility of the septum in the anterior 2/3 and of the impossibility of performing „good sutures” at this level. Under these circumstances, we decided the use of exclusion technique (Tirone David)3 by suturing a large patch of bovine pericardium, redundant, which was attached at distance from the infarction area and stuck to the true ventricular septum by the high pressure in the left ventricle. Figure 1. 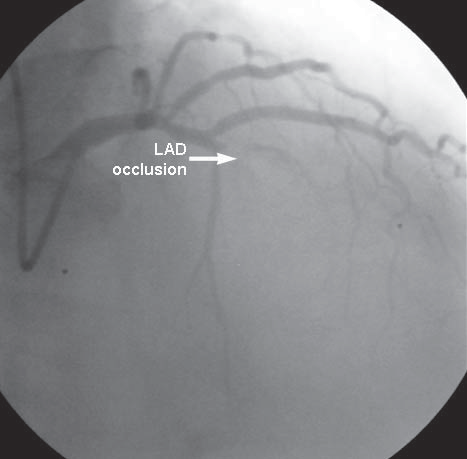 Coronarography (right anterior oblique incidence): LAD occlusion. LAD: left anterior descending artery. Figure 2. 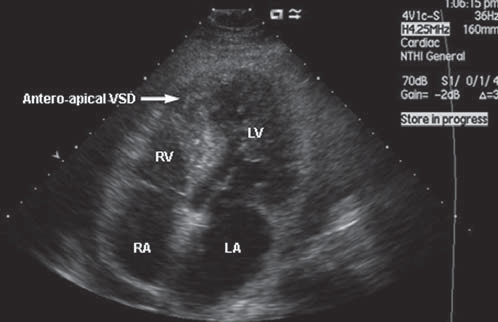 Transthoracic echocardiography (4 chambers incidence) anteroapical VSD. VSD: ventricular septal defect; RA: right atrium; RV: right ventricle; LA: left atrium; LV: left ventricle. Figure 3. Large left ventriculotomy exposure: antero-apical VSD with infarcted septum. VSD: ventricular septal defect. Figure 4. Exclusion technique: large pericardial patch sutured at distance from the VSD. VSD: ventricular septal defect. RV: right ventricle; LV: left ventricle. Figure 5. 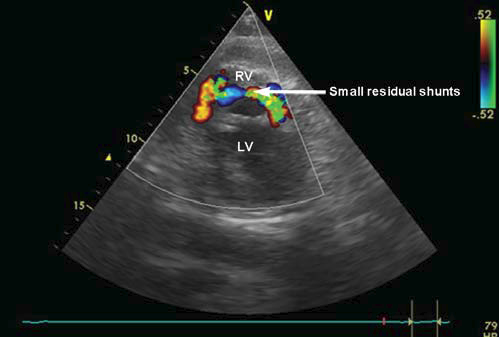 Postoperative transthoracic echocardiography (short axis): 2 small residual shunts. RV: right ventricle; LV: left ventricle. reduction of the shunt with all consequences arising from here. The persistence of the two shunts (the complication is described in literature at about 45% of patients operated for ventricular septal rupture)13 associated with the presence of repetitive pleural collections raithe sed the issue of an aggressive or conservative therapeutic attitude. The residual shunts with hemodynamic impact involve either the iterative surgery with a reinforced patch suture in the dehiscence area, or using the Amplatzer device for closing the residual shunts. Because the total shunt fl ow was low, with a total Qp/ Qs = 1.3, the patient being hemodynamically stable, without signs of hepato-renal failure, we preferred to adopt a conservative attitude: echocardiography repeated after 3 days, puncture of the pleural collections if necessary (5-7 days) and specifi c medication. Finally, after 3 weeks post-surgery, shunts and pleural collections disappeared and after 18 months the evolution is excellent. The surgery of the ventricular septal rupture remains a challenge for the cardiac surgeon, due to high mortality in the absence of surgery and of the high perioperative mortality. safer surgery or cardiac transplantation, but this has to be confirmed by future studies. 1. Crenshaw BS, Granger CB, Birnbaum Y, Pieper KS, Morris DC, Kleiman NS. Risk factors, angiographic patterns, and outcomes in patients with ventricular septal defect complicating acute myocardial infarction. GUSTO-I (Global Utilization of Streptokinase and TPA for Occluded Coronary Arteries) Trial Investigators. Circulation 2000;101:27-32. 2. Agnihotri AK, Madsen JC, Daggett WM. Surgical treatment of complications of acute myocardial infarction: postinfarction ventricular septal defect and free wall rupture. In: Cohn LH (ed.) Cardiac surgery in the adult, New York: McGraw-Hill Medical, 2012: 606. 3. David TE, Armstrong S. Surgical repair of postinfarction ventricular septal defect by infarct exclusion. Semin Thorac Cardiovasc Surg. 1998;10:105-110. 4. Papalexopoulou N, Young CP, Attia RQ. What is the best timing of surgery in patients with post-infarct ventricular rupture? Interact CardioVasc Thorac Surg. 2013;16(2):193-197. 5. Antman EM, Anbe DT, Armstrong PW, Bates ER, Green LA, Hand M. ACC/AHA guidelines for the management of patients with ST-elevation myocardial infarction – executive summary: a report of the American College of Cardiology/American Heart Association Task Force on Practice Guidelines. Circulation 2004;110:588-636. 6. Arnaoutakis GJ, Zhao Y, George TJ, Sciortino CM, McCarthy PM, Conte JV. Surgical repair of ventricular septal defect after myocardial infarction: outcomes from the Society of Thoracic Surgeons National Database. Ann Thorac Surg. 2012;94(2):436-444. 7. Dawson AG, Williams SG, Cole D. Does the placement of an Amplatzer septal occluder device confer benefi t in patients with a post-infarction ventricular septal defect? Interact CardioVasc Thorac Surg.2014;19(6):1040-1047. 8. Hajj-Chahine J, Roth G, Freger N, Vallat A. eComment. 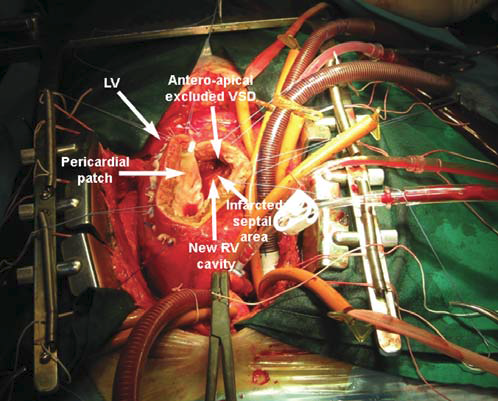 Percutaneous closure of post-myocardial infarction septal defect. Interact Cardio-Vasc Thorac Surg. 2013; 16(2):196. 9. Attia R, Blauth C. Which patients might be suitable for a septal occluder device closure of postinfarction ventricular septal rupture rather than immediate surgery? Interact CardioVasc Thorac Surg.2010;11:626-629. 10. Thiele H, Kaulfersch C, Daehnert I, Schoenauer M, Eitel I, Borger M. Immediate primary transcatheter closure of postinfarction ventricular septal defects. Eur Heart J. 2009; 30:81-88. 11. Torre MW, Centofanti P, Attisani M, Patanè F, Rinaldi M. Posterior ventricular septal defect in presence of cardiogenic shock: early implantation of the impella recover LP 5.0 as a bridge to surgery. Tex Heart Inst J. 2011;38:42-49. 12. Seyfarth M, Sibbing D, Bauer I, Fröhlich G, Bott-Flügel L, Byrne R. A randomized clinical trial evaluate the safety and effi cacy of a percutaneous left ventricular assist device versus intra-aortic balloon pumping for treatment of cardiogenic shock caused by myocardial infarction. J Am Coll Cardiol. 2008;4:1584-1588. 13. 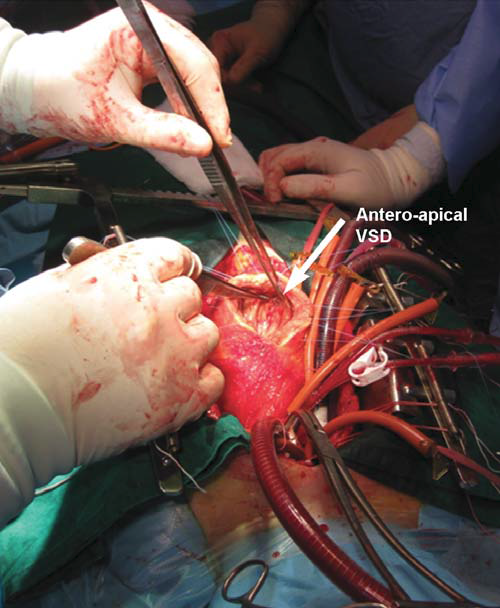 Zhang B, Liang J, Zheng X, Jiang G, Yang Z, Zhang L, Zhang Y, Sun H. Transcatheter Closure of Postoperative Residual Ventricular Septal Defects Using Amplatzer – Type Perimembranous VSD Occluder. J Invasive Cardiol. 2013; 25(8):402-405.